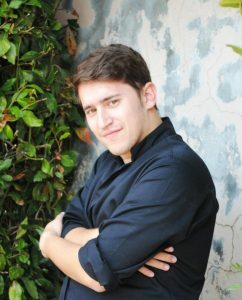 André Cruz was born in Lisbon, Portugal, in 1988. He studied piano until he was nine; since then, he devoted his time to choirs. At the age of seventeen, he started conducting the Staccato Ensemble vocal group and, in 2007, became a member of the Lisboa Cantat Symphonic Choir. At the age of eighteen, he started the Singing course at the National Conservatory Music School in Lisbon, Portugal. In 2011 he became a member of the Lisboa Cantat Chamber Choir and also a member of Calouste Gulbenkian Foundation’s Choir. As a singer, he has participated in Interpretation Masterclasses with the conductor Armando Vidal and João Paulo Santos and in the Kurt Thomas Course (conducting course) as soloist. Currently, is studying Choir Conducting with Rob Vermeulen and Singing with Jón Þorsteinsson at Utrecht’s Conservatory. He is currently a member of the EuropaChorAkademie and works as vocal coach in cooperation with Prof. Joshard Daus in his Brahms Chor an der EuropaChorAkademie in Bremen (Germany).